Clariant (Australia) Pty Ltd announces the opening of a new state-of-the-art applied research centre in Brazil. A world leader in speciality chemicals, Clariant has opened its newest Mining Application and Development Center (CADM for its initials in Portuguese) for Clariant Mining Solutions in Belo Horizonte, Minas Gerais, which will serve as the company’s global excellence centre for iron and phosphate ores and pelletizing. Strategically located in the state of Minas Gerais, the Clariant Mining Solutions Application and Development Center will provide solutions to the Brazilian mining industry. This comprehensive chemicals lab will work in partnership with Clariant Mining Solutions’ global R&D facilities network in developing new products to support customers and the mining industry. Finlay Morrison, Vice President and Head of Business Line Mining Solutions comments the CADM is strategically located in Belo Horizonte at the heart of the Brazilian mining industry, close to customers, universities and research centres. 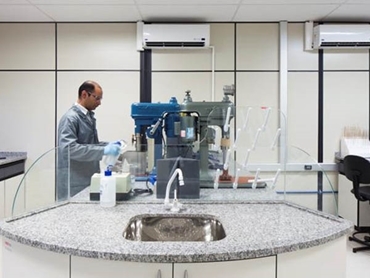 He explains that the new laboratory reflects Clariant’s commitment to innovation and consolidates its 35-year presence in the Brazilian mining industry as a leading supplier of chemical solutions. The new CADM facility is staffed by scientists and researchers from a number of different mining-related fields and will develop custom flotation solutions for phosphate, iron and sulphide ores. It will also support the development of specialised reagents for pelletizing, dust control, filtration, settling, rheology modifiers and corrosion and scale control. The Mining Application and Development Center in Belo Horizonte will operate in line with Clariant’s research facilities in Germany, Australia, Chile, Peru, the United States, China, India, Russia, Morocco, and South Africa.